Grocery shopping may not be the most exciting topic to talk about, but it is something most of us have to do on a regular basis. I get lots of questions related to all things grocery shopping, so I’m happy to share with you some of my grocery shopping routines. I enjoy grocery shopping and if I’m by myself, I like to go down the aisles, find new products, admire the colorful fruits and vegetables, look at all the possibilities and come up with new meal ideas. However, since I grocery shop with two active little boys most of the time, I have to be very focused and efficient, because their attention spans are very short. 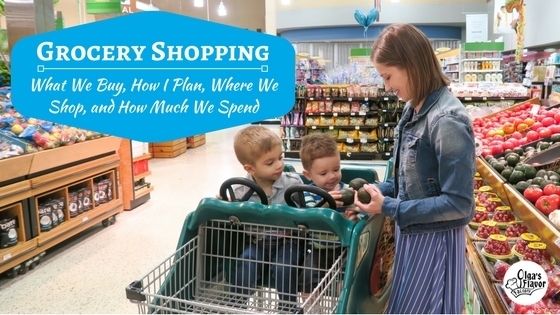 How Often and Where Do We Shop? I usually go grocery shopping once a week where I stock up on all the things that we need. If we run out of something unexpectedly or I forgot something, my husband can stop by a store on his way home from work for a gallon of milk or bananas. 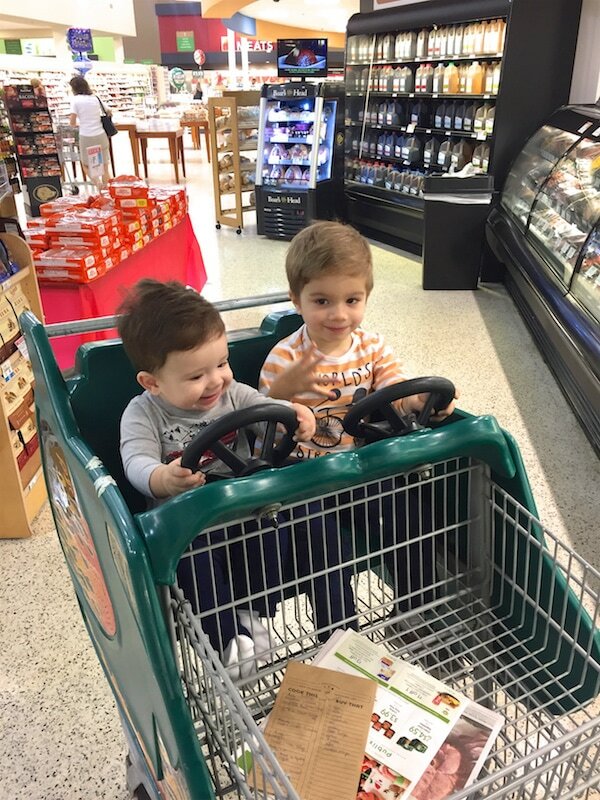 Since my boys are a little bit older now (1 and 3), I usually go to two grocery stores that are close to one another. We go to Aldi first and then get everything else we need at Publix. Both are less than 5 miles away from my house, so it’s doable for me. 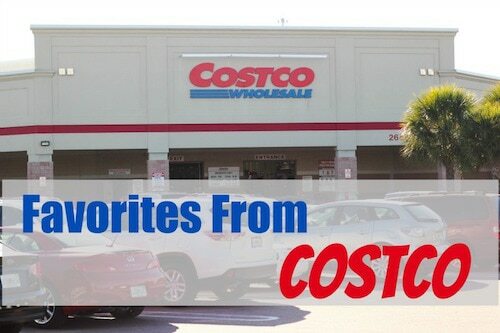 About twice a month we go to Costco, but we go as a family because we think Costco is a fun excursion. Well, Sergi and I do, anyway. Even though the boys are with us, it’s like a combination date night/family outing. 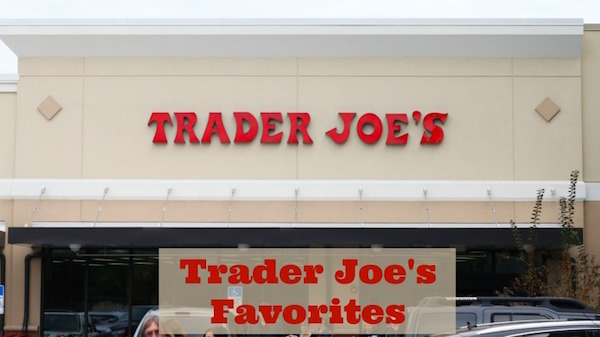 Sometimes we go to Trader Joe’s too, but that’s usually once a month or every other month. Every once in a while I will go to other grocery stores, like Sprouts, or a farmer’s market, etc. In that case, I will only go to Publix, not Aldi, Costco or Trader Joe’s. Pretty much, no more than two stores per week. 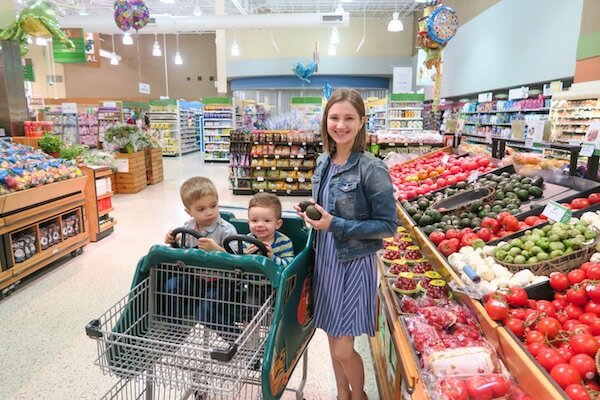 When the boys were younger, it was much harder to go grocery shopping with them, but now it’s much easier and I have more experience, so I always have a few tricks up my sleeve to make the experience a good one. Now, they get really excited when I tell them we are going to the store and point out all the Publixes that we drive by. First of all, never go during naptime, if they are tired or hungry unless it’s an emergency. Even then, I would rather ask my husband to go or order our groceries online (which is an awesome option. I tried two different services when I was recovering from c-sections and loved both.) Second, keep the trip short, so a list in a must. Third, bring lots of snacks. I have a list of things that we buy every week, like milk, eggs, bananas, fresh herbs, etc. so those things immediately go on my grocery list. 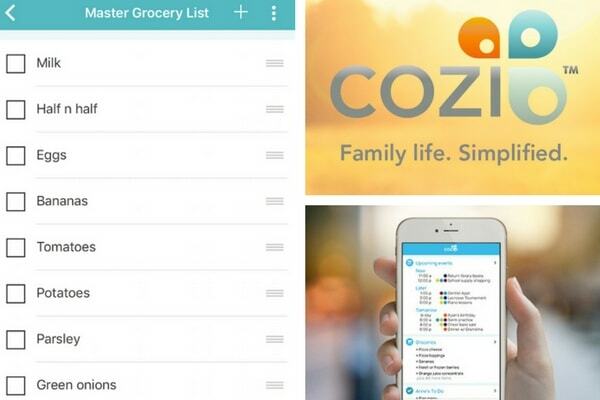 I have the Cozi app on my phone, so I have a running grocery list on there all the time. When I do my weekly menu plan, I will look through all the meals that I’ll be cooking and write down the other ingredients that I’ll need. 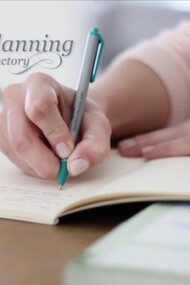 I also have a paper pad for my grocery list in a kitchen drawer, so if I notice I’m running low an ingredient while I am cooking or use up the last of something, I can write it down quickly while it’s fresh on my mind, otherwise, I will forget to put it on my list. When I’m meal planning, I will get that list and add it to my phone list. If I don’t have a lot of time, I will get a quick picture of the list with my phone before running out the door. I also like to keep certain things in my pantry, freezer, and refrigerator in stock at all times, even if I won’t use them that week. These are things that don’t spoil, so if something is on sale or I’m going to Trader Joe’s, I will stock up. Having a well-stocked pantry is really great because if your plans change, you have unexpected visitors or just don’t feel like eating what’s on your meal plan, you can come up with some great alternatives without going to the store multiple times throughout the week. We spend on average about $150 per week for our family of 4. My boys are still pretty small, so I’m sure we’ll be spending even more when they get older:). However, that is a rough estimate; if we have guests over, we obviously spend more and when I’m blogging (testing new recipes, photographing new recipes) we spend sometimes twice that much. Other weeks, when I’m only cooking for our family, we can spend even less, $75-$100. Food is such a fluctuating variable in our budget, and we are totally ok with that. 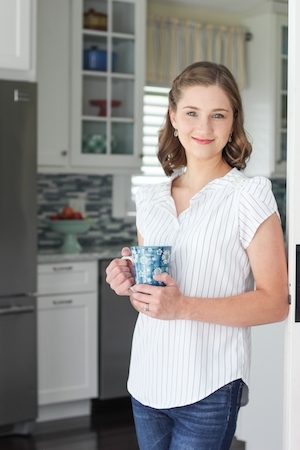 Over the years, I have learned to be pretty good at menu planning and using our groceries well, so we don’t throw almost anything away, and my husband and I are completely fine with whatever amount we spend. If we start throwing a lot of food out, that means I am spending too much money, but if it all goes in our bellies, then that’s money well spent:). We also love to share our home with others, so we are happy to spend more money on groceries. Of course, I try to be frugal, buy things on sale, get good deals, use things in season, but indulging in something once in a while is great too. We don’t eat crab, steak, and fancy cheese every day, but when we do, we enjoy it and don’t feel guilty about it. It’s also important to look at your overall budget, of course. If you need to cut down on expenses, that is very feasible too. Now it’s your turn! What do you use to make your grocery list? What’s your favorite place to shop? What’s your biggest struggle with grocery shopping? Or do you love going to the store every week? Omg Im spending way too much. We go to Costco weekly, each time we pay $180 to $250. My Costco credit card bill is at least $600 a month. In addition we go to supermarkets, that is also never less than $100. We are family of 5. You make it look so easy, Olga! My husband and I usually go grocery shopping and prep meals for the week on Sunday afternoon. We shop at a variety of stores to find the specialty gf/df convenience products that my husband’s diet requires like cashew alfredo sauce (quite tasty actually) but do the bulk of our grocery shopping at neighborhood walmart, winco or fred meyer. I use my good old fashioned notebook to get my grocery list down, that way hubby can see it and check items off as we’re shopping to divide and conquer. I really struggle with meal planning; gf/df, low fodmap and heart healthy cooking is NOT easy… especially when preparing all three meals of the day at home. I’d like to know what your husband does for lunch during work, I really struggle with planning lunches that stay fresh and aren’t boring. Constantly eating leftovers when you only have a handful of meals you’re rotating gets old, fast! Yes, great point! Or maybe even a breakfast for a husband, that he can eat on the go. I love it Olga! I like to eat a lot of plant based and less processed foods, I buy meat, marinade and portion out for my husband and whichever kid wants a bit of meat and freeze packets of it. 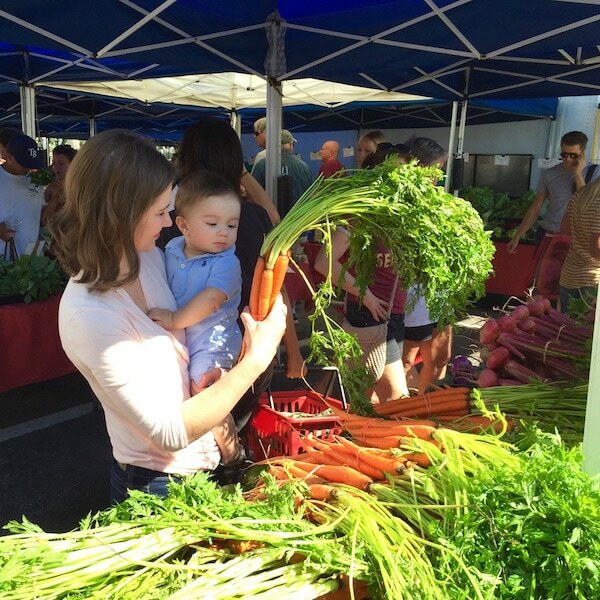 I spend around $100 monthly for our family of 6, buying organic when possible. I think the price changes depending on the state. For example you said recently that tomatoes are out of season and therefore pricey and tasteless. I agree 100% that out of season produce does not taste good, the last couple weeks here in WA state we have had a price drop on some foods such as tomatoes and strawberries, they taste better and taste better. Seems like they may be in season in neighboring states/countries. Either way, I enjoy planning and feeding my family and friends. Thanks for sharing your recipes and tips! Hi, which stores you shop at tallay? You keep your budget at a good low price? We love going to Costco with the whole family too! (3 kids lol and my sons name is Joshua also) Like u said, it’s a family outing/date for us! I write down my grocery list on my phone in notes since I have the phone with me every time I leave the house. I have forgotten to bring the paper grocery list with me before, and yeah not a good idea going into the store with out a list😬 Your kids are adorable! 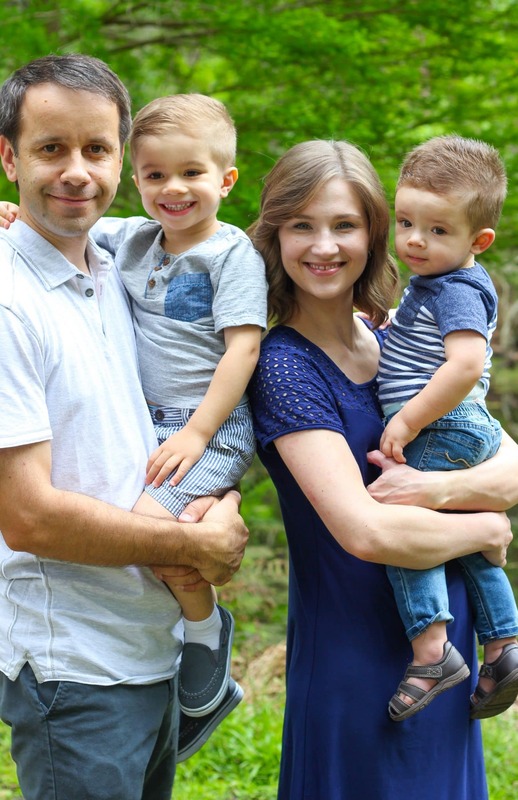 Olga you’re such an amazing wife and mother! I love your blog! Great tips on grocery shopping. I also try to hit Trader’s, Costco and Woodman’s (chain store in Wisconsin). 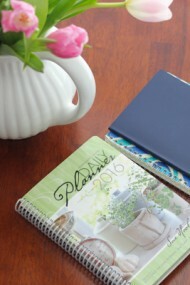 I feel like I can be wiser with what we spend (I’m still working on meal planning). I love the Cozi app too! Thank you so much for your kind words, Lena. Meal planning definitely helps save money:). Thank you for the awesome recipes and tips! Love them! I mostly shop at Winn-Dixie, Publix, and Wal-Mart, as all three are close by (within five miles) and there are deals at all of them. There is also a small market on my way from work that offers awesome prices for super fresh fruit and veggies, so I stop by once a week. Like you, I am keeping a grocery list on my phone. Thanks for the Cozi suggestion! I have been using a regular Notepad app, with a list option — I can type in the list and then check off things (it puts a line through). I agree –if menu is not planned ahead, perishables go unused. If I take a few minutes to plan, I know ahead of time just how I will use up the extras from some recipes. I plan the menu based on what is on sale/in season. I like Winn-Dixie and Publix apps for coupons/sales. Also, love Ibotta app (by the way, there is a nice referral bonus for trying the app, so ask who is already using it and bless them with a bonus)! As I check for sales/coupons, I just down the best deals and then see what I can make with those ingredients. Thank you so much for all your kind words, Smitha. 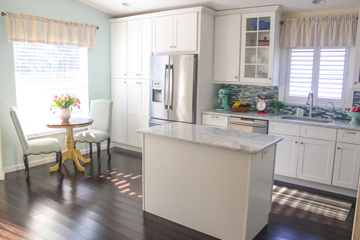 You are doing a great job – being a mother and keeping your home is a big task:). It’s always a struggle to stay on top of things – cleaning, cooking, taking care of children; it is a juggling act for me too.